There’s a lot of feedback getting collected in most organisations. The trouble is these feedback streams are separate and disconnected from each other. For example, the marketing team might run a customer-facing NPS program; project teams may be using Survey Monkey for their partners and HR could run a climate survey for employees. All are OK in their own right but most leadership teams don’t think about building a whole of business picture that spans all key stakeholder groups. You don’t know what you don’t know. The other problem is that these disconnected streams fail to connect back to the strategic imperatives of the organisation. A big opportunity is being lost to align stakeholder groups like customers, employees and partners to what the leadership team is trying to achieve in the organisation – like brand promise, purpose, vision or values. In short, most feedback lacks coherence and alignment across the business. And it’s only the leadership team that can provide the direction to raise their feedback program to this next level. It’s not realistic to expect individual silos in the business to drive such integrated and aligned whole of business focussed thinking. This diagram shows how easy it can be. 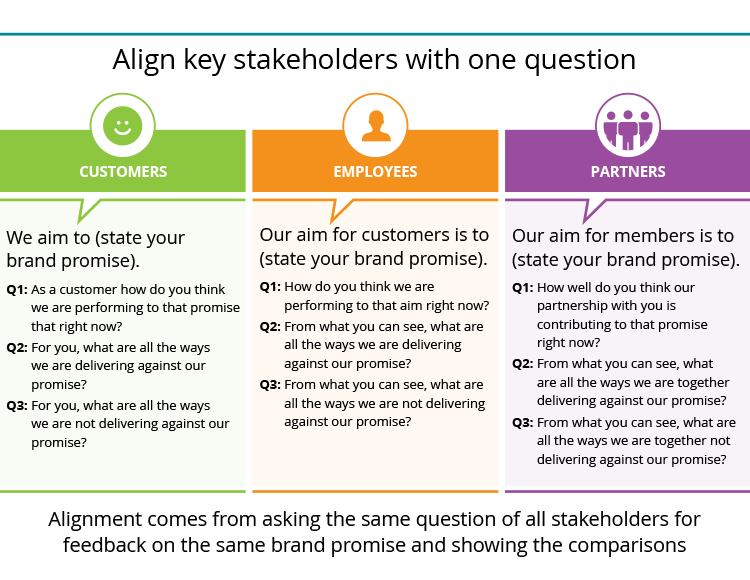 A single alignment question, in this case based on a brand promise, can be easily massaged to fit each stakeholder group. This achieves the desired coherence and also alignment to a strategic imperative. The two subsequent questions simply ask each stakeholder group to say where they think the company is delivering and where it is not. You can see how your customers think you’re going against your brand promise (or whatever your point of focus for the alignment program is). You can also simultaneously see how your employees think you’re going. Further, you have the power to explore the gap between them. This is a first test of alignment – how aligned are your employees to what customers think? Where are the gaps? How does this explain customer satisfaction and indeed employee satisfaction? Imagine if you’re following this over time and can see the impact of the interventions you’ve taken. You would be able to form baseline measurements, take actions and see what uplift in feedback you’re getting across your stakeholder groups. Then there’s the challenge around getting key stakeholder groups to focus on what’s important. Most organisations have a lot going on day to day, so it’s hard to get employees to focus on the big picture. Equally, strategic level messages do not always make it through to the customer, when most attention goes on short term transactions. Sparking conversations with stakeholders on an appropriately regular basis about what’s important has many benefits (for example, one organisation focussed its organisation on it growth objective and without doing anything except getting employees focussed on the issue, the firm grew for the first time in several issues). You need focus to get engagement. Maybe some of your managers will think they’ll miss the data they’re used to getting. HR might want the traditional array of metrics, but what better measurement of engagement is there than how many employees willingly and regularly tell you how they think you are all going together. And rather than focussing customers on willingness to recommend (which doesn’t drive success in many businesses anyway), imagine how direct feedback is for marketers and sales if they are rating you on your purpose. A communications program which keeps participants in the loop about what is being done. Boosting word of mouth – get all stakeholders talking about you in the way you want to be seen. Good advocacy brings the right sort of new business and cheaper recruitment of people who want to work for you for the right reasons. Now that’s a straightforward way to have people dancing to the same tune.